We were delighted to have one of our projects featured in a slide show and article put together by Houzz called "Good Dog! Cute Pooches at Home". We've embedded the whole slide show at the end of this post, but here's a screen capture of our project (and its pooch) from the very lengthy article. Prevent an Accidental Escape: Workers need to be able to come in and out of your home without fear that your dog will make a run for it through an open door. Keep your dog contained, ideally in a room far from the renovations. Your dog will appreciate having a calmer environment and your construction crew will be able to work freely. Establish a Safe Place: Construction equipment, debris, tools, paint, glass, wire ... renovation is filled with items that could harm your dog if they are swallowed, stepped on, etc. It is important to set up a safe zone for your pet where he or she can stay out of harm's way and feel safe. Acclimate your dog to the safe place before construction begins and provide all of his or her familiar toys and bedding. If all parts of your home will be under construction, you may want to consider boarding your dog or using doggie daycare during the construction process. Stick to a Routine: Home renovation is unsettling. Provide some stability for your dog by adhering to his or her regular routine for feeding, walking and sleeping, if at all possible. Be sure to spend lots of quality time with your pet to make him feel loved and protected! With lots of TLC, your dog will probably do just fine during a renovation. For proof, just take a look at all these happy pets in the Houzz photo flip of dogs at home. Most of these spaces have been recently built or renovated! In 2012, Paul wrote a guest post for Boston.com's Boston Real Estate Now blog. The post was on renovating homes for multi-generational living as a tough job market encouraged many adult children to move back home. You can read the post here: Catch the Multi-Generational Housing Wave. Fast forward three years later, and multi-generational housing is still generating a lot of buzz. "Thirteen percent of all buyers purchased a multi-generational home, one in which the home consists of adult children over the age of 18, and/or grandparents residing in the home. This is most prevalent among Younger Boomers aged 50 to 59 at 21 percent. The most common reason for this living arrangement among Younger Boomers was children over 18 moving back into the house (37percent), followed by health/caretaking of aging parents (21percent)." The report went on to say that cost savings were behind 24 percent of the decisions to make a multi-generational home purchase. 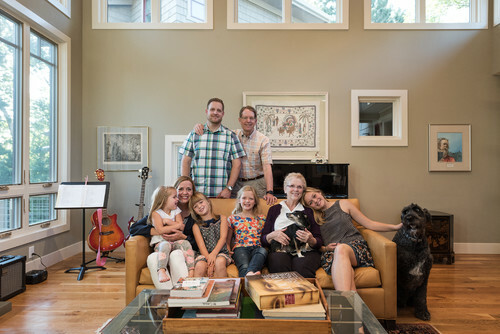 In a high-priced real estate market such as Boston, multi-generational living has particular appeal as a cost-savings measure. Successful multi-generational living requires a fine balance between private and communal spaces. Separate entrances, morning bars or kitchenettes in bedroom suites, and sitting rooms provide much-needed privacy. A large, open kitchen/eating/living area is ideal when the family comes together. Flexible spaces can be easily transformed to function for different purposes and ages. For example, an underused living room and sunroom may transition into a home office, then an in-law suite, then a space for an adult child who moves home, then an entertainment area. Universal design works hand-in-hand with flexible spaces to create environments that are usable by all people. Hallways that are wide enough to accommodate a wheel chair and zero entry thresholds are classic examples of universal design features. Of course, the big question once you have crafted (or bought) the perfect home, is how multi-generational living will work. We were delighted that Houzz recently devoted an article on the topic. We've shared the article as a slide show below. Just click any of the images to read the full article on Houzz. If you are considering remodeling a Boston area home for multi-generational living, please give us a call at 617-666-4460 or contact us by using our online form. We'd love to share our insights to help you create a home that works well for various lifestyles! Pocket doors are not just for small spaces! While they are often used to provide privacy when a traditional swinging door occupies too much floor or wall space, a pocket door is also an ideal solution if you want the ultimate in flexibility.A pocket door slides into the wall when not in use. Without the visual obstruction of a door, spaces flow together. When you want privacy or a more intimate space, simply pull the door closed. In the Back Bay renovation above, we used pocket doors to provide the best of both worlds -- smooth traffic flow throughout living areas when the doors are open, with an option to close off kitchen clutter from primary entertaining areas when the doors are closed. The ideal time to install pocket doors is during construction or renovation when the walls are open. It can be significantly more difficult (and expensive) to retroactively install a pocket door into a finished room. For more examples of pocket doors and good advice about hardware, we are pleased to share this recent Ideabook from Houzz.com. To view the Ideabook full size on Houzz, simply click on any image or caption. In early 2014, we published a quick guide called "How to Plan a Successful Renovation". In it, we shared the story of a gentleman who contacted us two weeks before Christmas to inquire about renovating a bathroom as a Christmas gift for his wife. It would have been a wonderful gift -- if he (and his wife) started planning the renovation months earlier. What are the secrets for successful home renovations? Take a look at our guide on the topic and this recent Houzz Ideabook by Toronto architect Jeffrey Veffer. He makes some great points! To read the full article on a single page on the Houzz website (as opposed to the excerpted slide show mode shown here), just click any photo. Plesae give us a call at 617-666-4460 or email Paul if you have any questions or would like to discuss your project. Boston is known for its highly educated population -- which means that even in this era of e-readers, homeowners tend to have a lot of books. It is not unusual for book storage and display to play a role in our home renovations for clients. In one recent project, we actually had to create a basement library before we could proceed with renovation plans for first and second floor spaces. The books were occupying as much room as the furniture! Our most popular photo on Houzz.com is this simple bookcase tucked into a hallway. We've designed and built some very creative solutions to the book storage dilemma, but we're always open to new ideas. We found some in an inspirational Ideabook on Houzz.com called "Bye, Bye Bookcase: Inventive Ways to Store Your Reads". Take a look! Tired of a dark, cramped kitchen? Bring in light and open it up to the rest of the home by removing walls. If a wall is load-bearing and can’t be replaced by using a header beam, you may be able to get the open feel that you desire by using columns or a half wall. If removing a wall is not an option, installing an interior window on the wall between the kitchen and an adjoining room makes the kitchen feel larger and gives it better sightlines. Doubling the width of the entryway or using archways instead of solid doors both achieve a similar effect. Finishing a basement or attic is a cost-effective way to gain additional living space without adding to your home’s footprint. Basements with a fieldstone foundation, significant moisture issues, or low ceiling height are clearly not good candidates for finished rooms. Otherwise, basements are fairly easy to remodel from a structural standpoint. Most are sturdily built, offer easy access to utilities, and walls can always be added to simplify electrical wiring. Radiant heating can be installed below the floor to counteract cold, while well-designed lighting systems can replace natural light if windows are limited. Renovating an attic can be a bit trickier. Angled dormers can often be accommodated in the design of the space, but low ceilings pose a far more significant challenge. Most attics also do not have an adequate point of exit and entry, so a new or remodeled staircase will have to be added as part of the remodeling process. Most attics are also not built with floors that can withstand day-to-day living, so you will probably need to strengthen the joists and lay down sub-floor if you are converting it to a useable room. An underused attic was transformed into a light-filled playroom. If you can’t be o utside, the next best thing is seeing it. Windows, skylights and glass doors instantly make a room feel more spacious by drawing the eye to the outdoors and letting in light and air. Transoms above doorways may not frame a view, but they can be a wonderful way to share a room’s natural light with an adjacent space. A skylight over a partial wall and porthole window flood this bathroom with natural light while establishing a connection with the outdoors. Privacy with Proximity – Successful multi-generational living requires a fine balance between private and communal spaces. Separate entrances, morning bars or kitchenettes in bedroom suites, and sitting rooms provide much-needed privacy. A large, open kitchen/eating/living area is ideal when the family comes together. Flexibility – Flexible spaces can be easily transformed to function for different purposes and ages. For example, an underused living room and sunroom may transition into a home office, then an in-law suite, then a space for an adult child who moves home, then an entertainment area. Universal Design -- Universal design works hand-in-hand with flexible spaces to create environments that are usable by all people. Hallways that are wide enough to accommodate a wheel chair and zero entry thresholds are classic examples of universal design features. The zero entry threshold to and from this sunny hallway makes the space easy to navigate for people of all ages and mobility. Need more ideas? Contact us about your project! Small is big right now. The media has been filled with stories about microapartments in cities from Boston to San Francisco. Recently, the Boston Globe even reported on a student who lived in a 130 square foot cottage in the middle of the Hampshire College green as part of a class project. While most of us will probably not live in a space as small as 130 square feet, there is widespread interest in living more efficiently. At Morse Constructions, we’re definitely finding that more homeowners want to maximize their existing space rather than add on square footage. Use an open floor plan: Hallways eat up valuable floor space, so your best bet may be to simply do away with them. Remove non-weight bearing walls to allow one room to flow into the next. An open floor plan will make your space feel bigger. Reduce door swing: Replace traditional interior doors with sliding panels or pocket doors that tuck out of the way when not in use. You can make better use of the space on either side of the door if you don’t have to worry about accommodating door swing. Choose built-in storage: Overhead storage or built-in cabinetry use space far more efficiently than stand-alone units that clog up walking and living areas. For maximum space efficiency, consider notching out a non-load bearing wall and creating a storage nook or small reading alcove. Think vertical: Are you making the best use of your walls? Floor-to-ceiling shelving or storage is wonderfully practical, yet can be visually stunning, as seen in this photo. Expand outside: Just look outside if you want more living space without increasing your home’s interior footprint. A patio, deck or porch will expand your living and entertaining areas during the warm weather for a fraction of the cost of building a full-fledged addition. When temperatures drop, you’ll be glad not to be heating extra square footage!